This 30.5mm.Rolex Oyster Perpetual reference 6478 is a very clean watch. 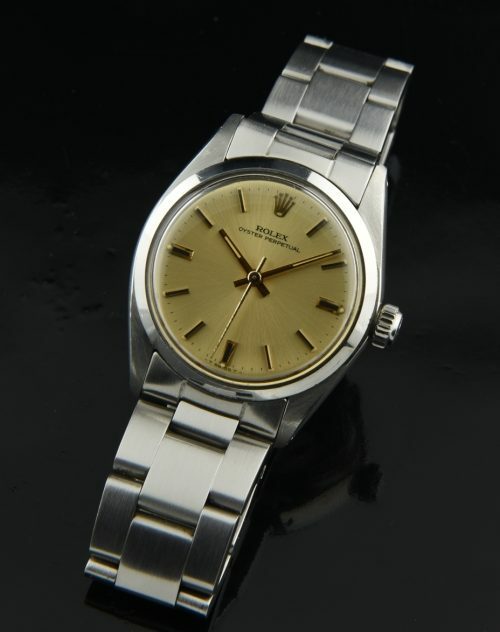 This ROLEX dates to 1978 based on the 5.5 million serial. Ref. 6478 is marked between the lugs. This is a mid-size ROLEX, produced for men who wanted a smaller watch, but larger than the 24mm. ladies watches from the same era and smaller that the 34mm. men’s versions. This would be an ideal watch for a lady. The original gold dial is very clean. The second hand has some light corrosion from age-nothing detracting. The stainless steel ROLEX OYSTER case and original thick 17mm. ROLEX OYSTER bracelet is quite clean for its age. The automatic ROLEX movement is accurate. These watches are actually uncommon, with much fewer mid-size watches produced over the years. Whether you are a man who prefers discreet watches-or a lady who seeks a fine and elegant timepiece, this ROLEX offers it all. Just $1950.